An 18-year-old track athlete presents with syncope during a 440 m relay. He has an abrasion of the knee, but no other injury. He has not fainted before. His older brother died at age 29 from what was thought to be marijuana laced with cocaine, although the cocaine levels were low. The family could not relate any further history. 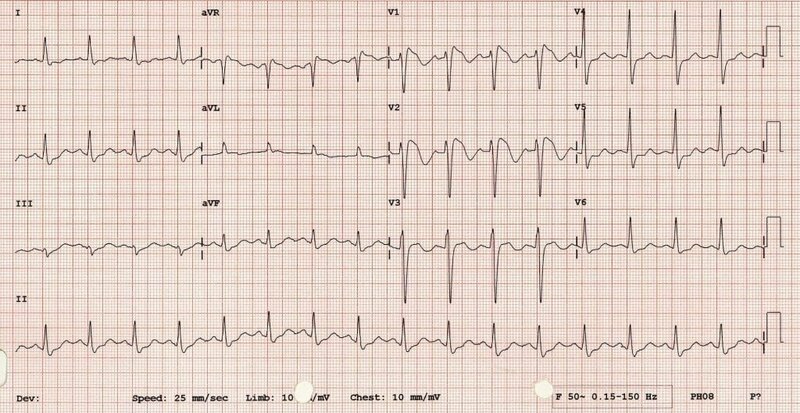 Which of the following findings, which are usually NOT picked up in a computer interpretation of the ECG, would be concerning in this patient? 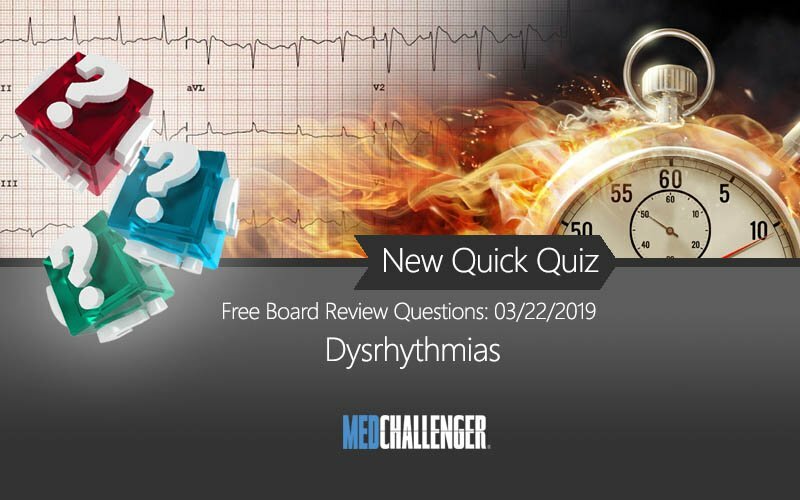 In a younger patient with syncope, Brugada criteria should be reviewed on the ECG. The above ECG shows a saddleback ST segment in V1-V3, usually not interpreted as such by a computerized ECG interpretation. 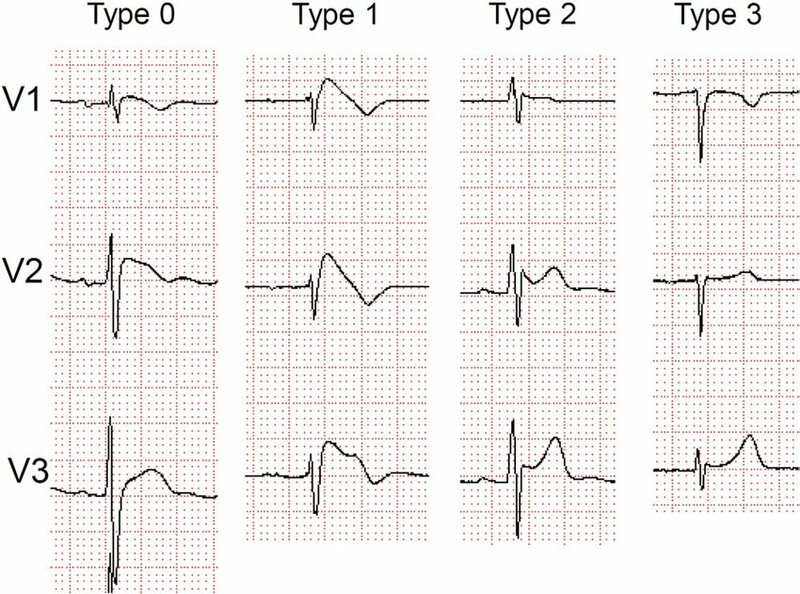 Brugada syndrome is an inherited cardiac anomaly without structural disease. It can be life threatening, and patients suspected of the syndrome AND have syncope should be admitted. Management of those that are noted to have the saddleback ST segment criteria in the absence of symptoms is controversial, but cardiology follow up is recommended. The other options (tachycardia, ST depression, acute anterior myocardial infarction, short PR interval) are typically picked up by a computerized ECG interpretation program. Brugada syndrome can present with several ECG patterns, some of which are difficult to appreciate unless the clinician has a matching history (young healthy person with sudden syncope). Yealy DM, Koswosky JM. Dysrhythmias (chapter 69). In Walls R, et al.